Has your baby doll's hair seen better days? Whether you have a doll from your childhood that you want to restore to bring back memories, or you've purchased a doll at a thrift store or flea market, making your doll's hair as good as new may be easier as you think. The most important step is to determine what type of doll hair you are restoring, because the process used for synthetic hair can damage human hair, and vice verse. Determine how the hair is attached. The most common types of doll hair are synthetic and human. Doll's hair can be attached directly to the scalp through a series of holes and glued from the inside of the head, or in the form of a removable wig. Determine if your doll's hair is synthetic or human. Human hair is almost never rooted into the scalp with holes. Although human hair will stick to the doll's scalp slightly, it will not be fastened with holes into the head of the doll. Synthetic hair can also be attached in a wig, but will likely contain more shine and maintain a permanent curl. If you can't tell whether the hair is synthetic or human, pull a strand of hair away from the doll's scalp. If the hair stretches, it is synthetic. If the hair breaks, it is human hair. If your doll has a synthetic or human removable wig, detach it. It will take some delicate effort to remove the wig as it may have been held in place with a few dots of glue. Carefully untangle the hair away from the scalp, tugging very carefully. If you can find spots where glue has been placed, carefully spray the area with water. Do not drench or soak the doll or the doll's hair. If the doll's hair or wig is synthetic, spray the hair with water and window cleaner. Spray the hair thoroughly with water. Then spray it with window cleaner like Windex, then spray it again with water. Detangle your doll's synthetic hair. Coat your doll's hair or wig in hair conditioner and leave on for five minutes before rinsing thoroughly with water. Comb through the wet hair with a pet brush comb with small metal tines. Comb the doll's hair until it dries. There is no need to restyle the doll's hair as the curl in synthetic hair is permanent and will reform as the hair dries. After you have removed the wig, pick out any tangles or snarls with an ice pick or sharp hair tool. After most of the tangles have been released, use a soft-bristled hairbrush. Soak the wig in a solution of Woolite and warm water. Fill the sink or a basin with warm water and add a capful of Woolite. Using tweezers, pick any glue residue out of the doll's hair that has gotten lodged there during cleaning. Rinse thoroughly. Soak the wig in a solution of vinegar and warm water. Fill the sink or a basin with warm water and three or four drops of vinegar. Soak the wig for several minutes, then rinse thoroughly. Dry the wig. Place the wig between two towels and press gently. Place the wig on top of another dry towel and lay out to dry. Be patient, it may take up to an hour for the hair to dry. Restyle the hair. Human hair can be restyled, so feel free to use a warm curling iron on the hair. Be very gentle and do not put the curling iron up all the way. Do not use a brush on synthetic hair that has been used on human hair. 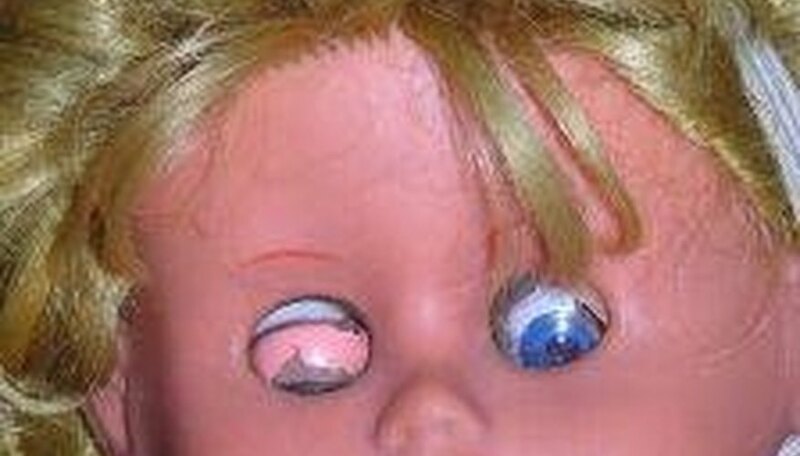 Do not allow your doll's eyes to get wet--if the doll's eyes do get wet, place the doll face down on a paper towel for three to four hours. Do not use heat on synthetic doll's hair or it will melt. Can You Wash & Shampoo Synthetic Hair Wigs?